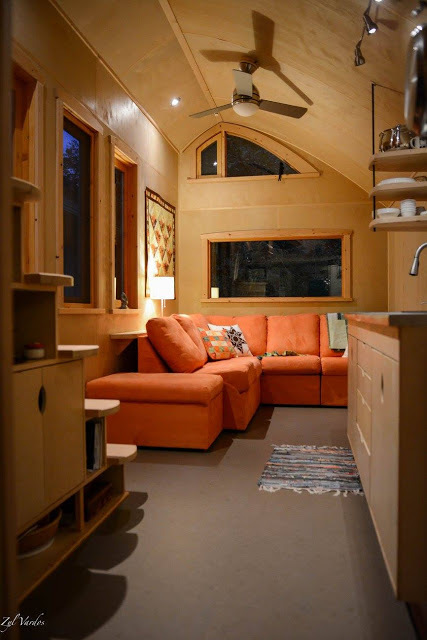 This is the Ampersand Tiny House on Wheels. It’s designed and built by Zyl Vardos in Olympia, Washington. Another Zyl Vardos beauty. More modern than many of his previous builds. So many elements I love. Am trying to figure out the easiest way to modify my cabinets to include the toe-kick drawers. Need every possible bit of storage in my small kitchen. Usually I dislike all wood interiors as they look like you would be living in a sauna, however I love this type of wood panel finish. I also like the roof line which makes the loft that much more open. I would remove the ‘L’ of the sofa to create more floor space but that’s just your own choice of furniture. The overall colour scheme is great and the choice of darker woods at the windows avoids a uniform look. Well done to all who worked on this house. Great house for one or two people! If the kitchen counter were extended, you could put a washer cabinet there. I don’t currently recommend any of the combos that are available in North America. They have too many technical problems. There are some great compact pairs though! FYI: I am the builder of this house. Glad you all like it!!! Lovely craftsmanship as usual. What is the floor made out of? It looks like it might be rubber? I ADORE your homes, they sre simply beautiful in everyway. Please don’t stop building them, I’m saving up! I am assuming you are talking about the bathroom: This sink is quite narrow, so you would stand at the END of it.. not on the longer side. It is comfortable to use this way. Suggest you use a computer rather than a phone or tablet. No problems at this end, using a PC and sometimes a laptop. This man is a genius, love everything about this one and his designs in particular. Excellent use of space, I wonder if the deck is removable for transportation. Very clever to put the refrigerator under the staircase! There doesn’t seem to be a W/D, but I guess you could fit a small one under the staircase, where those doors are now. There does seem to be a tall cabinet/closet next to the stove, with pots hanging on the front of it. OMGosh by golly I love this!! A real sofa set up, stairs with a handrail. Special touches like the curved window and door glass the mimic the design or the homes roof shape. And NO draweror cupboard handles to bump into, but cutouts. And look at ALL that storage space even in the kickboard areas. There’s a little snafu with the sofa. The shelf under the window — with the lamp on it — is 2 inches too low. The back of the sofa doesn’t fit under the shelf so there’s a 6-8 inch empty space behind the sofa. For a tiny house, that’s significant. But the fix is really easy, just raise or remove the shelf. Situation Normal, All Fouled Up! We usually have a couple with kippers for breakfast, three or four more by supper. To maintain perspective, handmade wine or craft beer helps. Vivacity Organic Sippin’ Gin is reserved for a really great FUBAR. Or so we hear. …or possibly one could remove the feet from the sofa so the back could slide under the shelf? I like the stairs a lot. For one thing they access the higher side of the ceiling, and they have a rail. So often one sees stairs with no railing. Or….room for more storage back there! If the sofa were pushed under the shelf, you would bump your head on it. So, it is placed nicely just level with the back cushion. The owner stores some folding tables in the gap behind the sofa. Really love this one. Very cozy just love the color they chose for the couch. It seems bright and airy. Love all the windows especially the one in the loft!! Love the woodwork, and all the storage under the stairs. Awesome kitchen cabinets! This tiny home is really lovely!! Carol??? My favorite is the use of toe kick drawers. Great use of space! Love the stair cubby holes too. It’s cute, but I HATE that bathroom!!! So tiny with the toilet so close to the sink. No way I could put up with that. 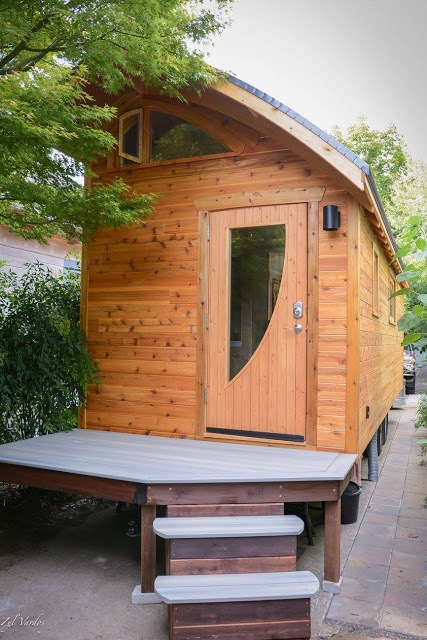 How much did it cost to build this tiny house? This house is so beautiful! !!! WOW! You could put up lots of narrow depth shelving over the toilet to artfully arrange all those toilleteries. Sofa accommodates extra guests (but don’t let them get too comfortable). Vardos is a genius with windows, so creative! I also love the toe kick drawer with all the foil and such and the countertop! What exactly is that made of? It looks like stainless steel but has a wavy pattern. It is heavy gauge stainless steel. I welded it, then put the ‘wavy’ brush finish on it myself. I like this one! I like this one a lot! Sexiest Tiny House I Have Ever Seen!! Wow. What can I say? I Love all your homes Abel. They all take my breathe away. Such a great craftsman. I would love one of your homes,now I just need the money. I love it it’s different, but yet not over the top that it would scare hell out of the neighbors if you parked it on your property… Almost everything that has come from Zyle Vardo’s has been done with good taste and with thought behind his designs……. So many windows, I’m afraid I would feel like a gold fish. Light is excellent, except for heat in South and sleeping in darkness. This is nice too, it’s got a lot of storage spaces. 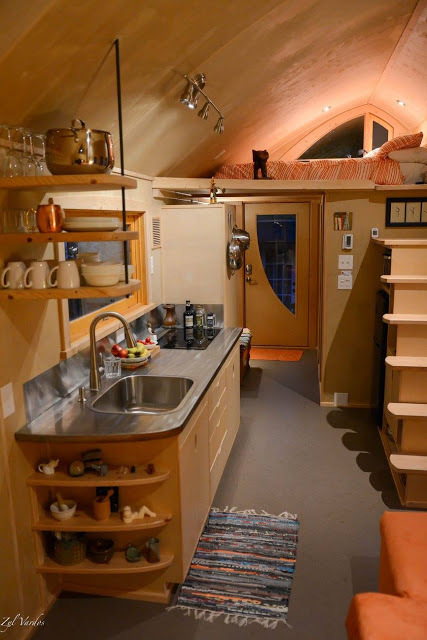 A very practical tiny home. Is Zyle Vardo a real man or a group of engineers? Say like the Wizard of Oz,because his designs are pretty far out there but beautiful. Does he custom make those curved glasses for the windows n doors? Or where do they come from? Keep up the good work!! Actually, his name is Abel Zimmerman Zyl; he posted a comment earlier in this discussion. A vardo is a gypsy wagon, and his THOWs are designed to resemble them, hence Zyl Vardos. I am real. I design all my structures AND build them at my shop (yes, I have a few carpenters). We create all our windows, doors, cabinets, roofs, and metal work. About the name: My friend Dee kept calling my work Zyl’s Vardos, and I guess it stuck. However, they are pretty ‘out there’ to be considered Romany vardos. Wow! I am 67 with health issues. Have had a knee replaced, had open heart surgery. 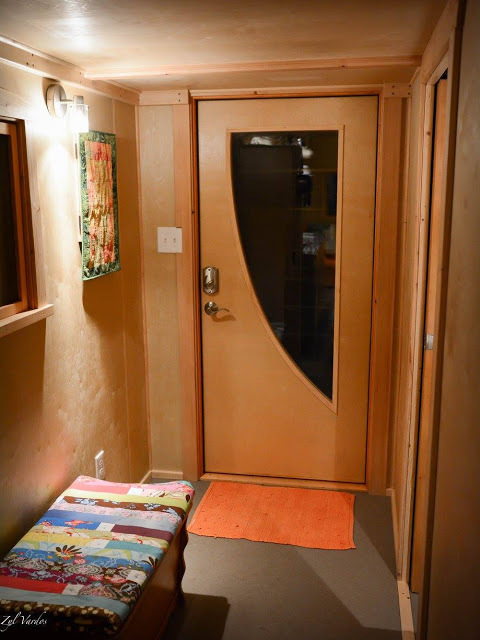 I currently live in a 396 sq ft house, but dream of a handmade THOW, but many of them don’t look accessible for someone like me. This one is perfect! The stairs are very accessible and if, for some reason, I couldn’t get up them, I could be comfy on the sofa. And the loft has quite a tall ceiling and a lovely window. Seems to be quite a bit of storage. And the light wood gives it an airy Scandinavian look. And the lovely door! I just love it. One of my all time faves. If only I was wealthy! I have noticed the past month or so, many people are calling their tiny houses on wheels THOW, Tiny house RV’s.Which they are not meant to be Recreational Vehicles unless built inside a van, bus, or truck vehicle. I understand a Tiny house can be moved from one site to another, since it is on wheels, being the person has a proper vehicle or uses a tow truck that can handle pulling at least 10,000 to 15,000 pounds. To continuing to pull it around,from area to area, like it was a true RV,would likely cause damage to the THOW such as cracked or broken windows, drywall or tile problems , correct me if I am wrong. The initials RV do not belong with tiny houses just a technicality ,but every one still may continue to design, have fun building and enjoy living in their THOW. Please do not think it is an RV to pull all over the place, hopefully no one has been misled by this mislabeling. You can always tell a Zyl Vardo because it generates so many comments and so much excitement! Love this flat-back build. It is so very interesting to see how this asymmetrical curved roof space is articulated in the hands of master craftsmen. The only other one I’ve seen is Anita’s “Lilypad Planet” in Portland built by Small Home Oregon (Walter Quade) but that interior interpretation is very ethnic whereas this one is modern-homey. If I could purchase this build, though, I would change the bathroom. Possibly a standard flush with a sink-above (the water tank) would allow a freer flowing articulation and more body space..
Love all the rest of it; a homey feast for the eyes. Beautiful, ingenious design, really like this one. Just wondering what kind of flooring that is… I love that it has no seams. Could you please tell me what it is made from? Thanks! I thibk this is exquisite! I love to lounge on the couch after a tough day. ? So many tiny homes have such limited seating. This home is superb! Well done. I think I’m the 3rd or 4th to inquire after the flooring. I’m thinking true Linoleum or Marmoleum brand. Still, would also like to know for sure. Love the entire place (here comes the but). If the curve of the roof was a bit greater, there would be more toe room at the bottom of the bed in the loft. 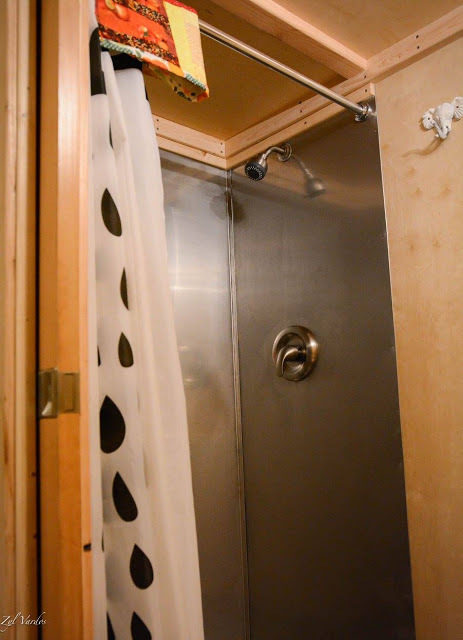 I’m only 5’3″ and it looks cramped to me. I imagine it might cause some issues with bending the sheet goods, though. Just a thought. I sure would love to know a source for that sectional! I don’t think there is a design of Zyl’s that I don’t love. He is a true artist and craftsman. My dream is to own one of his masterpieces one day! OH my goodness!!! This is stunning! I sure wish I could afford one of his creations!!! Very well done on this one. For me the only change l would make is putting a frosted glass on the front door. It’s great! And frosted glass is a great idea! Zyl Vardos, the man who incorporates simple design elements that make a place so, so special. His name seems to be a byword for amazing design and incredibly meticulous and well thought out construction. He is the best! So masterful. Yes please let us know where we could purchase the sectional seen here. Thanks.beautiful design. Ooooh, what a sweet space! The wood surface is beautiful – the is a warmth and whimsy that marries perfectly with the modern finishes. The loft appears to be little more than space for a bed – sort of a bed shelf, but at least it is easily accessed – no ladders for me, thank you. Yep. I could live in this. Well done, Zyl Vardos; I am a fan! I really like most of the features. I don’t care for tiny bathrooms unless there is enough room to stand in front of a sink, with a mirror. Of course, to each his own. That shelf behind the couch leaves unused space (or space not easily acessed). I would remove shelf, push couch to that wall and attach shelf at the opposite short side, or maybe at seat level with skinny cabinet below? I would put some kind of railing so people won’t fall off 2nd floor if they roll out of bed by accident. Also, I would make the steps with hinges because they’re deep. Main floor sleeping doesn’t automatically mean it’s the main sleeping area. Main levels often conflict with living room usage. So compromises like a couch that turns into a bed is a common solution, along with Murphy beds, trundle beds, day beds, etc.